Upper Devonian, Middle Frasnian, Domanik Formation. The Chut River, outcrop 7: fig. 1 - sample 7, fig. 3 - sample 0', fig. 6, 7 - sample 87; borehole Zapadnaya Visertynskaya-1, sample K-447d-90 (depth 3601-3616 m): fig. 2; borehole Shuda-Yag-1003, sample 21 (depth 110.2-111.0 m): fig. 4; borehole Shuda-Yag-1002, sample 19 (depth 65.2-65.8 m): fig. 5. Fig. 1. Clear alternation of strata (a) silicified shale, (b) silicite, (c) flint-limestone with remains of Tentakulita form oriented accumulations along bedding planes: FF-L003/007 (bar=8mm). Fig. 2. 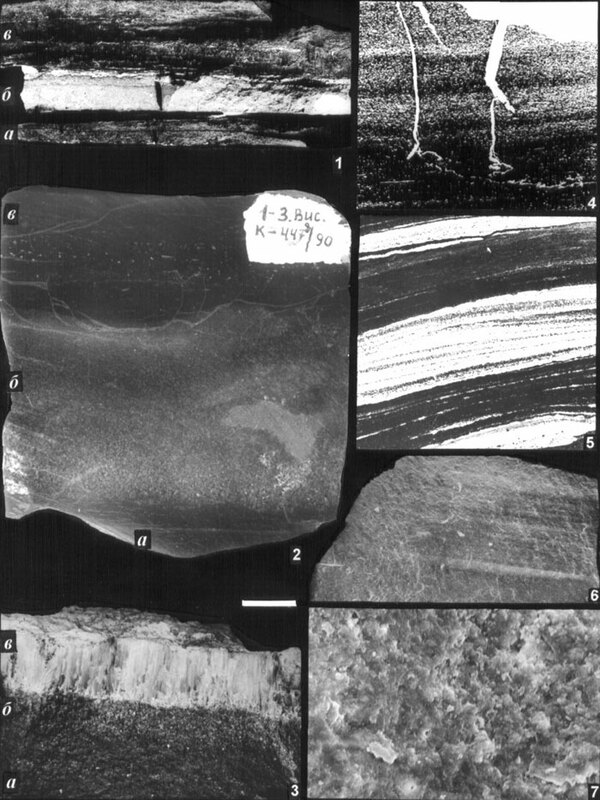 Gradual transition of strata (a) black flaggy cherty silicite, (b) dark gray silicified limestone with fine detritus, skeletons of Radiolaria and Tentakulita, and coarse pyritic inclusion, (c) black limestone with thin individualized interlayers of tentaculitid limestone: FF-L031/K-447d-90 (=12mm). Fig. 3. Gradual transition of strata (a) fine- and macro-grained bituminous limestone, (b) couarse-grained bituminous limestone; and (c) clear boundary of couarse-crystalline columnar limestone: FF-L003/000' (=9mm). Fig. 4. Microlamination of bituminous limestone with rhizoid traces: FF-L001/075, thin-section (=3mm). Fig. 5. Obliquely and lentiform laminated limestone (white) alternation with calcareous flint (gray) and cherty argillite (black): FF-L001/014, thin-section (=1,5mm). Fig. 6, 7. Ultralamination of flint-limestone (rock samples were disintegrated by 15% solution of acetic acid): FF-L003/12530: 6 - (SEM=300µm), 7 - (=20µm).